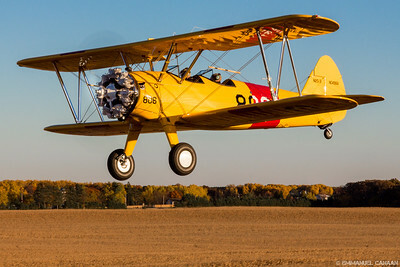 These images of a Boeing Stearman Model 75 N2S-3 were taken on October 15, 2014 near Princeton, MN and the Rum River. 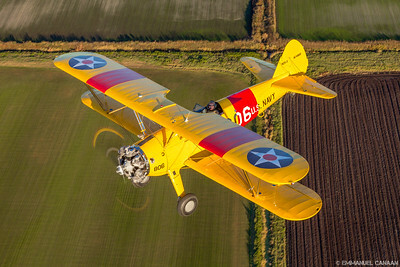 Accompanying me on this flight were fellow photographer Max Haynes, photo ship pilot Jason Erickson, and Stearman pilot Ryan Mohr. Pilot Ryan Mohr gives us a thumbs up as we prepare to do some air to air photography while passenger and aircraft owner Mike Donatelli rides up front. 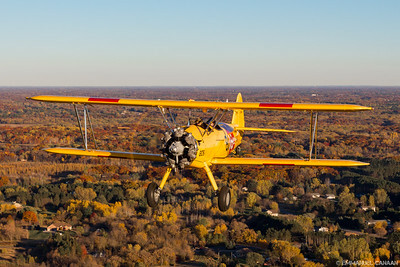 A Boeing Stearman has a close encounter with my lens, low over the Minnesota landscape. 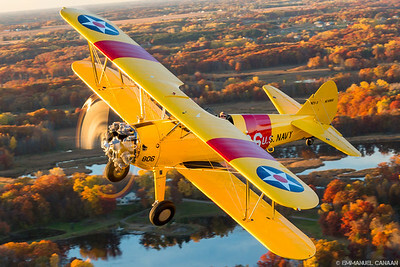 A Boeing Stearman cruises low over the farms that are the lifeblood of Minnesota. 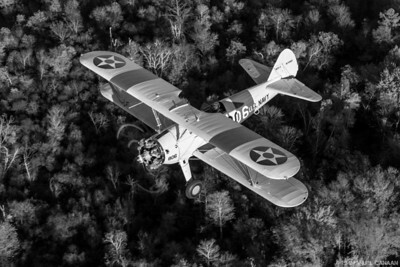 A Boeing Stearman daydreams about a moonlit flight over Minnesota. 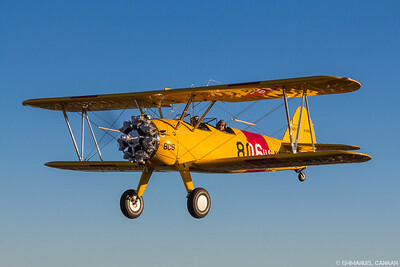 A Boeing Stearman comes nearly head-on with my lens as we head towards Princeton, Minnesota. 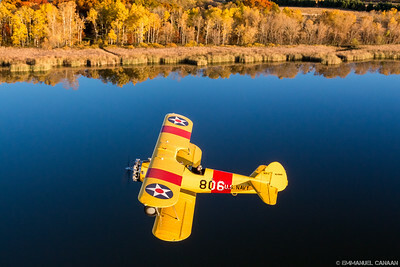 A Boeing Stearman hops over lily pads on a Minnesota lake. Not quite a crop duster, but still capable of some seriously low flying, a Boeing Stearman just grazes a field of crops north of Minneapolis, Minnesota. 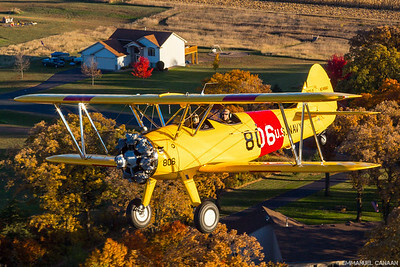 Boeing Stearman pilot Ryan Mohr shows off his low-flying skills for the residents of Princeton, Minnesota, while staying in tight formation with photoship pilot Jason Erickson. 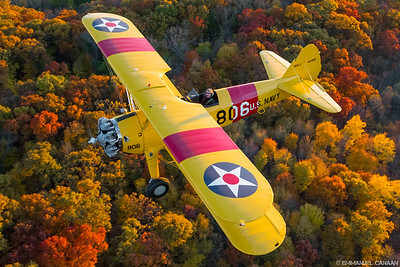 The right combination of colors brings out the beauty of this beautifully restored, WWII-era, Boeing Stearman. 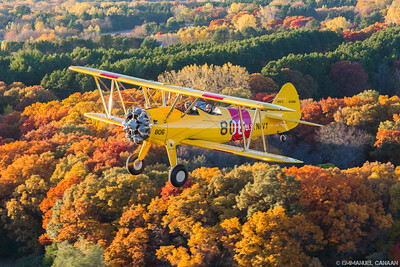 Peak fall colors can be seen here as a Boeing Stearman skims the forest near Princeton, Minnesota. 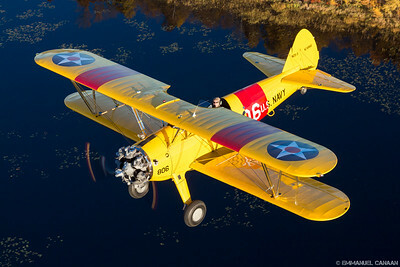 A Boeing Stearman comes so low over this glass-smooth lake surface that one might think it was preparing for a water landing. 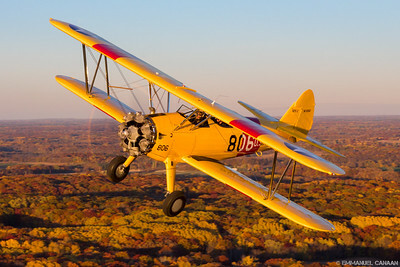 A beautiful prop disc can be seen on this Boeing Stearman as it basks in the glow of the setting sun over Minnesota. 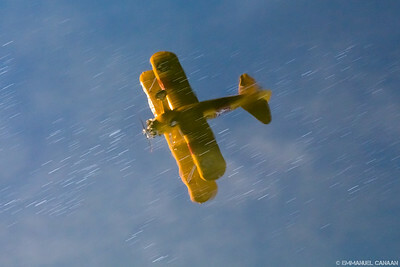 The reflection of a Boeing Stearman biplane is seen here in a Minnesota lake as the aircraft passes low over the water. 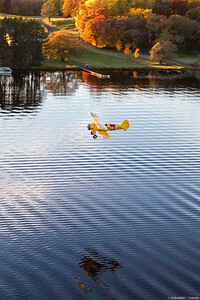 A Boeing Stearman cruises low over a Minnesota lake on a beautiful fall evening. 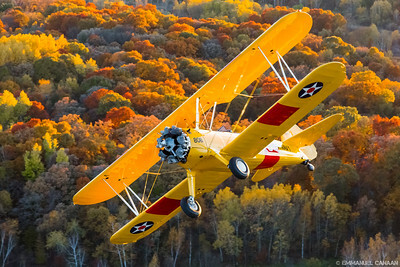 A Boeing Stearman basks in beautiful golden hour light while cruising low over Minnesota. 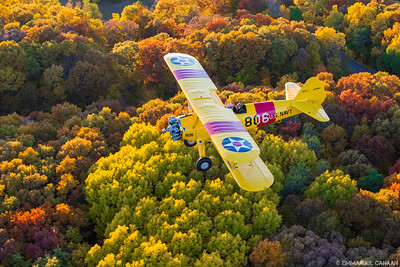 A rainbow of fall colors can be seen as a Boeing Stearman passes low over Minnesota. 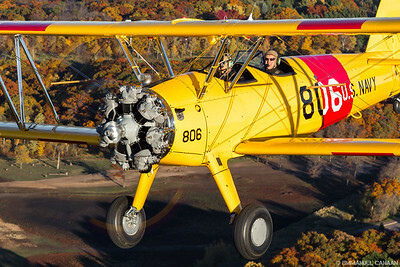 Pilot Ryan Mohr takes the owner of this aircraft, Mike Donatelle on a beautifully smooth ride over Minnesota. Rear seat pilot Ryan Mohr ducks down to keep his eyes on our photo ship as we make a tight formation turn over Minnesota. 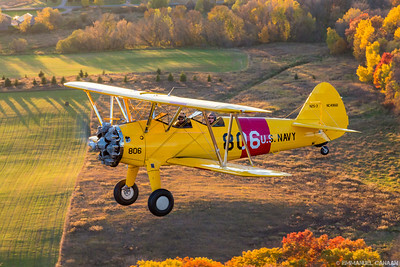 The setting sun over Minnesota provides the best conditions to highlight the beautiful colors of this Boeing Stearman, as well as the landscape below. 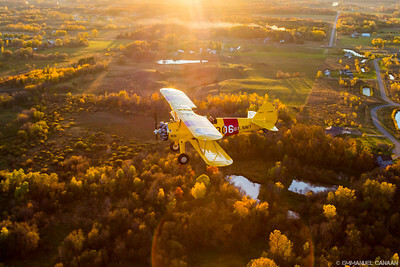 A Boeing Stearman basks in the glow of the setting sun over the Princeton, Minnesota area. 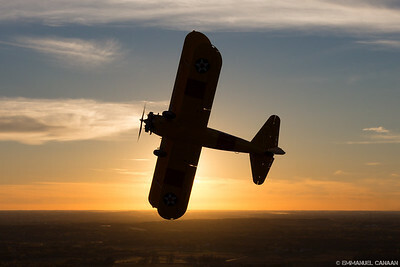 A Boeing Stearman shows off its elegant curves by eclipsing the setting sun. 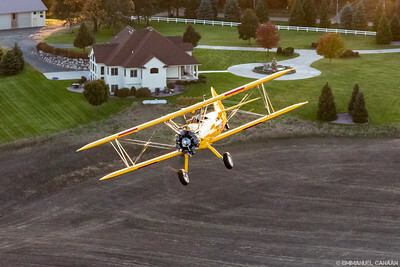 A Boeing Stearman flies low enough to either startle or delight the residents of this home near Princeton, Minnesota. A beautifully restored Boeing Stearman cruises low past some very complementary fall colors while on a golden hour photo shoot over Minnesota. 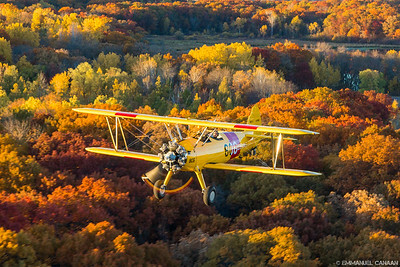 Pilot Ryan Mohr cruises low over the colorful fall foliage of northern Minnesota in a beautifully restored WWII-era Boeing Stearman Model 75 N2S-3 biplane.